The extraordinary journey that began in Miss Peregrine's Home for Peculiar Children continues as Jacob Portman and his newfound friends journey to London the peculiar capital of the world. But in this war-torn city, hideous surprises lurk around every corner. Like its predecessor, this second novel in the Peculiar Children series blends thrilling fantasy with never-before-published vintage photography to create a one-of-a-kind reacting experience. I received a physical of this from Quirk Books. Thank you to the publisher for giving me a chance to read and review this. I read Miss Peregrine's Home For Peculiar Children last year, and I enjoyed it a lot more than I thought I would. The thing with these books is you shouldn't let the covers deceive you. They may have spooky covers, but the story inside isn't at all scary. What I love about these books is the images inside. They illustrate you on your journey through the book. This is great if you need help picturing everything that goes on. I also think they help to take you on a journey through the book. Some photos just amaze me so much. The story in Hollow City begins exactly where the first book left, which is great. So a fantastic start already. I thought the storyline of this book contained a lot more adventure than Miss Peregrine's, and I liked that there was more going on. It also has a lot of mystery inside, as well as action. The story ended on such a high that I need the next book now as it was an interesting plot turn. I was like "Well damn, Mr. Riggs. You just can't leave me hanging like that when you do that to me!". The peculiar children are such fantastic characters. They all have different characteristics and personalities, that you can't help but like them. I want to meet them so badly. To have them as friends would just be so awesome. Jacob is a very strong and brave main protagonist. He tells the story from his perspective. I haven't read a lot of books told from males, and Jacob is definitely one of my favourites. The fact that he goes on this journey to help characters he hasn't known for long is something that I admire. He has risked a lot to be in that position. The only dislike I had was that the writing style to me comes across as a little old-fashioned, but this may be because it's complex and very descriptive. I found at times I had to concentrate very hard when reading. 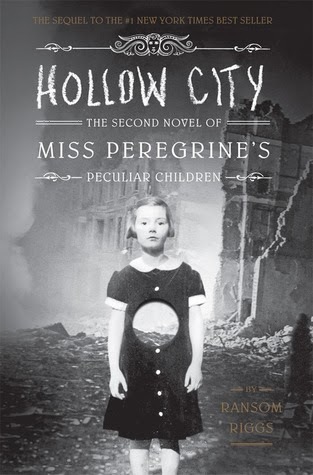 Overall Hollow City is a spooky adventure that you don't want to miss out on. I do recommend this series, and in the end I gave it four out of five stars.